Codling moth (CM) -- 1st generation, first sustained trap catch biofix date: May 16, Saturday. Codling moth development as of July 2: 1st adult emergence at 70% and 1st generation egg hatch at 16%. In most orchards, insecticide targetted against plum curculio and apple maggot prevent codling moth damage. If targetted codling moth control is needed, key management dates are shown here: 1st generation 3% CM egg hatch: June 20, Saturday = target date for first spray where multiple sprays needed to control 1st generation CM. 1st generation 20% CM egg hatch: July 4, Saturday = target date where one spray needed to control 1st generation CM. Lesser appleworm (LAW) -- 2nd LAW flight begins around: July 11, Saturday. If first OBLR late instar larvae sample is below threshold, date for confirmation follow-up: July 7, Tuesday. Oriental fruit moth (OFM) -- 1st generation OFM flight starts: May 5, Tuesday; 1st generation 55% egg hatch and first treatment date, if needed: May 26, Tuesday. 2nd generation OFM flight begins around: June 28, Sunday. 2nd generation - first treatment date, if needed: July 6, Monday. 2nd generation - second treatment date, if needed: July 17, Friday. Redbanded leafroller (RBLR) -- 2nd RBLR flight begins around June 29, Monday. Peak catch and approximate start of egg hatch: July 12. Spotted tentiform leafminer (STLM) -- 2nd STLM flight begins around: June 15, Monday. Rough guess of when 2nd generation sap-feeding mines begin showing: July 5, Sunday. Optimum first sample date for 2nd generation STLM sap-feeding mines is July 12, Sunday. Second optimized sample date for 2nd generation STLM sapfeedimg mines, if needed: July 17, Friday. 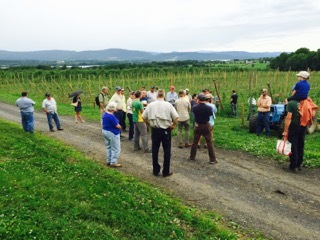 I was fortunate to attend an orchard tour in the Champlain Valley (NY and VT) last week sponsored by Cornell and U. of Vermont. Peter Jentsch of Cornell's Hudson Valley Lab was a featured guest. To my mind, he focused on two areas: dogwood borer, and internal leps and leafrollers (codling moth and obliquebanded leafroller mostly). Dogwood borer is one we really need to keep an eye on, particularly in dwarf orchards. 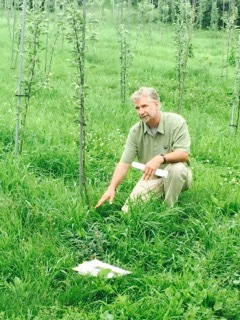 Peter thinks we are seeing more and more DB issues with the planting of hi-density orchards on dwarf rootstocks. PLEASE inspect your dwarf orchards (on the above-ground portion of the rootstock) for signs of infestation, and treat if DB are detected. A directed spray of Lorsban is the gold standard, however, mating disruption is also available. Adult DB are at peak flight right now and laying eggs! Regarding internal leps and leafroller, Peter says there are two management strategies: scouting for infestation, which can be difficult and time-consuming if done correctly, OR using pheromone traps and a degree-day model to target an insecticide spray when these pests are most vulnerable. He (and I) are in favor of the latter approach, and if insecticide sprays are properly timed, can give season-long control of most apple orchard pests. (Including plum curculio, apple maggot fly, and incidental leps such as redbanded leafoller, and lesser appleworm.) I hope to have more information (from Peter) on this approach going down the road, but in the meanwhile check out and subscribe to Peter's blog: http://blogs.cornell.edu/jentsch/. 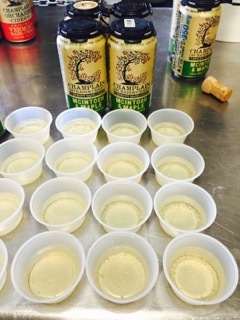 Oh, and did I mention those guys are really into hard cider over there: http://www.slyboro.com/, http://www.champlainorchards.com/cidery/champlain-hard-cider/. Finally, please visit our NEW UMass Fruit Advisor/Program website: http://umassfruit.com. It has been re-designed (not by me), and I have some reservations about it, but I woul d like your feedback. Don't be shy: do you use it? what's missing? what can/should we do different? I will say it is now mobile-friendly, so it displays much better on smartphones, tablets, etc. Oh, and I will be out in Washington next week trying not to burn up during the IFTA Summer Tour. So, there won't be any regular Healthy Fruit next week. (I will probably be checking in on Facebook and Twitter though.) Nor the following week -- come to the MFGA meeting if you need a dose of pest and horticultural management info. So, the next HF will be July 28. See The way I see it above for some comments on insect management. Sprays for codling moth and obliquebanded leafroller should have been applied by now, or if not, very soon, assuming you have these pests. (I bet you do.) Potato leafhopper (PLH) is still rolling in, be sure to scout young blocks of apples for presence/absence and treat as necessary. 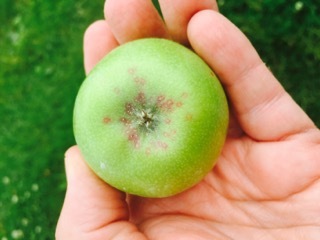 Too early to treat for apple maggot fly, but I bet with the moist soil conditions they are starting to emerge. Monitor with yellow sticky traps (below) or red spheres. Both available from Great Lakes IPM. 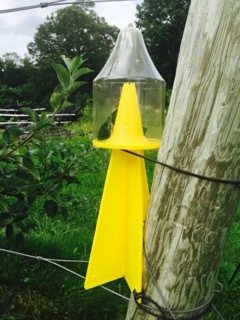 Note that we have also again begun to place stink bug traps in orchards around Massachusetts, with the expressed intention of monitoring for Brown Marmorated Stink Bug. I have purchased and used these stink bug traps with some success -- you might want to consider purchasing and placing a few in your orchard/buildings areas to monitor for BMSB. Certainly if you catch anything suspicious, let us know. you still have a San Jose scale (SJS) problem. It's getting late to treat these little buggers, and a good oil application next spring should be on your calendar. SJS is still becoming increasingly problematic. My top control option at this time and throughout the summer would be Sivanto 200 SL (from Bayer), however, I would only treat the areas where you suspect you might still have a problem with SJS. 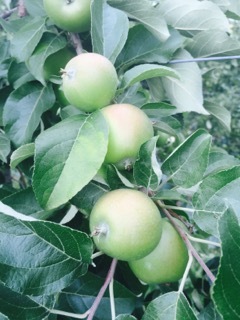 I am seeing more apples on the trees now that they are sizing up. Where I thought there might have been over-thinning (and initial panic) it is looking pretty good right now. All hands should be on deck for hand thinning apples and peaches if you have not already taken care of that. 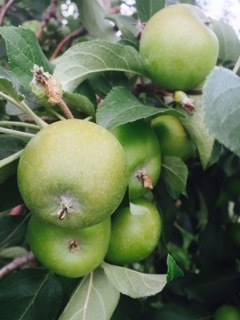 These Honeycrisp apples still need a bit of hand thinining! 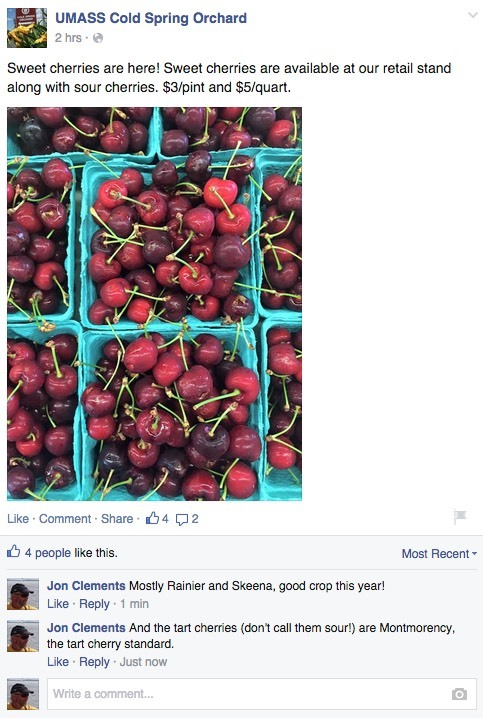 The next Healthy Fruit will be published on Tuesday, July 7 or thereabouts, 2015. As always feel free to get in touch with any member of the UMass Fruit Team (http://extension.umass.edu/fruitadvisor/team-members) if you have questions or comments.